FS’ management system (FSMS), known as How We Improve, synthesizes Lean process improvement methods and Balanced Scorecard strategy (BSC). This unique blend allows us to execute on goals and measures every day, and with every team, innovating and problem-solving along the way. When employees are empowered to decide what to improve, results follow. Our complementary goals of high employee engagement and significant performance gains have netted a ten-fold return on investment for Lean, and better customer service overall. FS teams have implemented over 20,000 ideas to make processes and services function efficiently. Our 80+ teams “huddle” to status work, monitor metrics, and experiment with “micro-innovations” they’ve designed. These ideas link directly to the BSC’s strategic objectives, which reflect the value we bring to campus: ease of use and access to our services, reliability, financial stewardship, efficiency, culture-building, and environmental sustainability. In 2006, FS adopted Balanced Scorecard (BSC) to set and deploy its strategy to all units and teams. 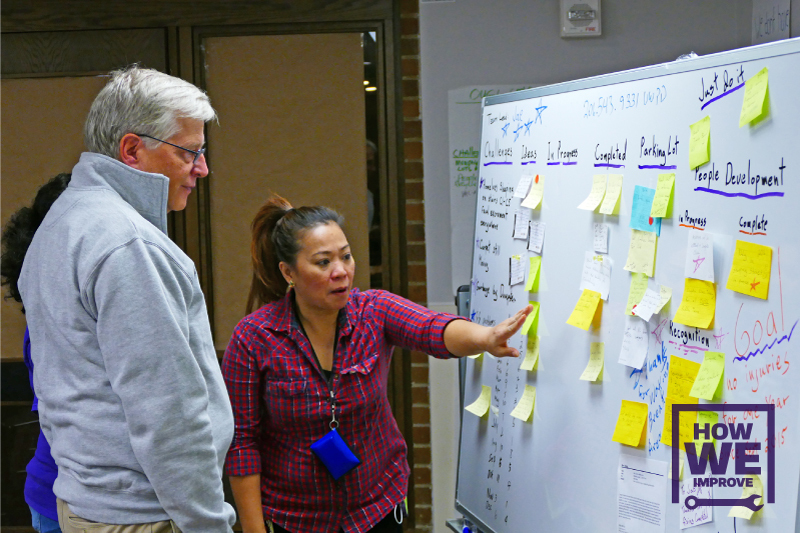 Focused on the companion themes of serving today and preserving tomorrow, strategic objectives are designed to move FS toward world-class service and innovation in the management of buildings, facilities and resources at UW-Seattle. Check out our latest balanced scorecard update on our blog. We set and deploy strategy and goals via BSC, and we execute our work using Lean improvement. The Shingo Model of Enterprise Excellence, based on the Toyota Production System (TPS), engages all employees, working at the process level, to constantly devise ways to deliver better service. Our brand of Lean uses the experience and expertise of people most directly involved in processes to improve them. In short, BSC provides direction to Lean-driven innovations—which is How We Improve. Mapping the value stream as a process occurs during a multi-day team launch, and the team is empowered to restructure the process, from its current state to a future flow. Targeted improvements align to the strategy and translate to concrete goals and targets for the team to accomplish. The team learns to generate ideas connected to instances where there is waiting, rework or a pain-point. Together, the team members organize those ideas into improvement objectives, and map them to a future state. After the 90-day improvement cycle is complete—and the launch goals are achieved—the momentum and Lean skills are applied to their normal, daily work: identifying pain-points in processes, incrementing improvements to close performance gaps, and managing the constant flow of ideas. Read about how our Regulated Materials Management Office’s used Lean to analyze the asbestos-abatement process and determine how better use of their historical data could save costs for both FS and client departments. Forward movement. In a service-delivery organization like FS, there are hundreds of operational targets; we monitor with gauges and dials that show us that campus is functioning normally. That’s the serving today part of our strategy. The preserving tomorrow part is focused on change and improvement. In order to meet the needs of campus, we must develop better and more efficient services, new processes, and revamped procedures to maintain state-of-the-art buildings and equipment. Our staff is highly trained in the skills and disciplines needed to sustain daily operation and accommodate growth. Increasing maturity with Lean in FS is about translating the change-focused goals of the larger organization to daily and weekly success targets that every employee can impact. Mature teams are huddling each day, reviewing goals, discussing gaps, generating ideas, escalating issues to leaders and other teams, celebrating and recognizing each other, and committing to improved customer service and the back-stage support processes that ensure it. Walk into a team huddle, and you will see on display the weekly, daily and hourly performance targets, so that all team members are aware of their status and progress toward key goals. Team members are informally discussing root-cause and contributing ideas to test their theories. Improvement occurs within the huddle itself, rather than outside of the normal work environment, or on a special project team or initiative. Every month or so, the team is stepping back to reflect on whether the actions taken are impacting achievement. Along the way, our organizational culture is adapting to this new way of working, becoming more open, more flexible, and more creative. We are hoping to build a principle-centered organization, where recognized Shingo guiding principles underlie our success: we lead with humility, respect every individual, assure quality at the source, create value for customers, and create constancy of purpose.